From History of Grant County, Wisconsin, 1881, p. 343. From History of Grant County, Wisconsin, 1881, p. 875 - 876. "Joel Allen Barber, son of Joel and Aseneth Meloin Barber, is a native of Vermont, and was born at George, Franklin County, January 17, 1809. His great grandfather was from England, and settled at Canton, Conn. His mother was of Welsh descent, and her father was a Captain in the Revolutionary army, serving through the war. Young Barber farmed till his eighteenth year, when he entered the Georgia Academy, and fitted for college; entered the University of Vermont in the summer of 1829; left at the end of two and a half years, determined to carve a career for himself. Read law with Hon. George P. Marsh, of Burlington; was admitted to the bar in Prince George's County, Md., in 1834, after teaching school there two years. He returned to Vermont and practiced at Fairfield until 1837, settling, in September of that year, at Lancaster, Wis. Here he has been in the practice for forty years, at times mingling land operations with legal business, but not enough to interfere with his profession. His legal knowledge is sound and extensive; he has a high standing as a criminal lawyer, and, in all respects, has long been an honor to the profession. "During the forty years that Mr. Barber has been a resident of Grant County, he has held some official position two-thirds of the time. He was on the County Board of Supervisors several yeras, and its Chairman five; was County Clerk four years; District Attorney three terms; three terms member of the Lower House of the Legislature; one term in the State Senate, and a member in the Forty-second and Forty-third Congresses. In the House of Representatives, he was on the Committee on War Claims and Revision of the Statutes. He seldom spoke, but was an indefatigable worker. "Originally Mr. Barber was a Whig of "Free-soil" tendencies, and naturally identified himself with the Republican party, to which he has steadfastly adhered. 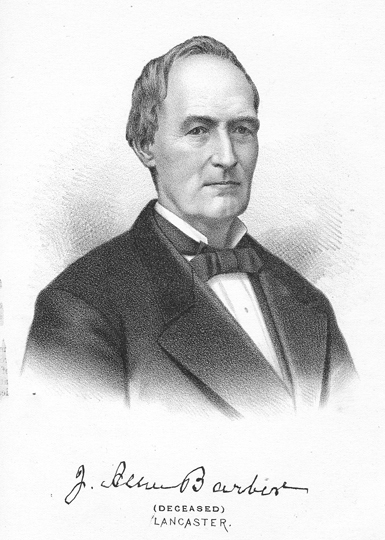 "Mr. Barber has abilities fitting him for any office in the gift of the people of Wisconsin; is a man of solid character as well as intellectual qualities, and is one of those statesmen whose records were an honor to a State." The foregoing appears at the head of an obtuary artice in the Grant County Herald, of June 30, 1881, furnished to that paper by Judge J. T. Mills, of Lancaster, which, by its original matter following the above, pays a very high and just tribute to the personal worth of Mr. Barber, in accordance with the writer's own knowledge, entirely supported by the popular judgment. Mr. Barber died at his residence in Lancaster at 2 o'clock A. M., June 28, 1881, of peritonitis, after a painful illness of one week. His burial followed in the afternoon of the 29th, amid manifest expressions of deep-seated and general sorrow, the pall-bearers being Judge M. M. Cothren, of Mineral Point; Ex-M. D., H. S. Magoon, of Darlington; Hons. William E. Carter and A. W. Bell, of Platteville; John G. Clark, of Lancaster, and C. K. Dean, of Boscobel. The press, local and in many cases remote and general, at once gave evidence of the high estimation in which the deceased was held, both in public and private life; which tributes, though they will fail to reach the consciousness of him whose virtues they commemorate, may yet tend in some degree to assuage the grief of those who live to mourn his loss. Gathering sheaves of testimonial from this wide field of obituary harvest, we shall find that J. Allen Barber, at the time of his death, and for many years prior thereto, had few equals in those qualities deemed essential in the institution of the highest manhood, or in the estate of the good and useful citizen. From these concurring evidences, there may truthfully be added to the record already given; that, though frequently honored with high political station, he had an intense dislike to all office-begging, and scrupulously avoided contaminating himself by this popular, and it is much to be regretted, profitable vice, one moment in advance of a strong and well-defined popular sentiment running in his behalf; that he was a friend and supporter of all rational public enterprises; a free giver in charity, and as a creditor to worthy but unfortunate debtors, a marvel of indulgence. And it may also be added that he was possessed of rare attainment in ancient and modern lore, and kept pace with all the developments of scientific research; and was a man who held his family endeared to him by the ties of affection, constancy, kindness and liberality. We are able readily to understand how, by virtue of his correct personal habits, his professional honesty and fidelity, his love of liberty and regard for public justice, and his impatient hatred of every grade of meanness and corruption, he early won and lastingly held the esteem of all good citizens having knowledge of his virtues. One, to have seen him in his most noble carriage, had but to hear him in conversation among friends; or pleading at the bar; or, more conspicuously still, addressing a popular assembly on matters touching the rights of any oppressed person, however humble, or of masses of people, or, touching the maintenance of the honor and integrity of the Union. Then the ordinarily hidden impulses of his nature would become strikingly manifest in his earnestness of speech and gesticulation, set off by the glow of his highly intellectual features. This exalted trait in Mr. Barber's character is further shown - aesthetically in this case - by the designs and inscriptions embellishing that excellent work of art and patriotism, the soldier's monument, standing in the court house square at Lancaster, as he was one of the committee who had this matter in charge when this work was done in 1867, his associates being Addison Burr, of Lancaster; George R. Laughton, of Platteville; J. C. Cover and Judge J. T. Mills, of Lancaster. The broken shackle, token of four and one-half millions of slaves made free; the declaratory mandate of President Lincoln's Emancipation Proclamation, that timely, giant stroke of a noble pen, which gives to this token its mighty significance, engraved upon the marble faces of Grant County's most honorable memento, speak also as well of the loyalty and humanitarian impulses of all the several members of this citizen committee. True history, especially of a personal nature, affords grand incentives to all laudable ambition, and in this view it is not an unreasonable hope that the youth who may hereafter have their lots cast in Grant County, on reading this history of one of its earliest settlers, and learning to what high degree of merit and esteem he managed to attain by his own unaided efforts within this field of labor, mainly, will find herein a fresh and an abiding incentive to highest possible endeavors in the way of usefulness and good citizenship, within and for the advantage of this same field of labor. This biography and portrait generously submitted by Roxanne Munns. If you would like a better quality copy of the portrait, please contact her.